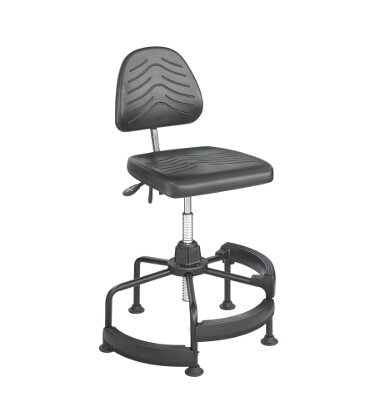 The going get tough with the TaskMaster Deluxe Industrial Chair. Difficult tasks don't stand a chance. With a 15 year warranty it offers an overall height of 17" to 35" with an 8" of pneumatic lift and an additional 10" with our Wave Tube Extension. Features include paddle lever controls for 10° seat tilt and 22° backrest tilt. Ergo knob controls 5" backrest height adjustment. 2-1/2" seat cushion depth. 360° swivel. Each features a 5-leg, 26" dia. tubular steel base with 2-1/2" high-impact nylon glides for safety and stability. Sturdy, ergonomically correct high, mid and low-rung polypropylene footrests mount securely to base. Covered with Black microcellular, self-skinning polyurethane foam for extra comfort. Assembly required.